All pharmacy students in the UF College of Pharmacy are required to have health care coverage under a health insurance policy. Thus, pharmacy students can select health care providers in their communities to meet their needs. Pharmacy students in Gainesville are required to pay a health care access fee for the fall and spring semesters to utilize the health care services at the Student Health Center and the Counseling and Wellness Center. This fee is part of the annualized tuition and fees approved by the state legislature and the Board of Governors. Pharmacy students at the Jacksonville and Orlando campuses are not charged this fee since they cannot conveniently access these services at the Gainesville campus. Thus, this fee is not part of the annualized tuition and fees. Pharmacy students at the Jacksonville and Orlando campuses can pay a health care access fee that allows them to utilize the same or similar health care services in a university setting as Gainesville students. The information below at each campus is derived from the web sites for the student health care facilities at each campus. Even though these summaries may present some different topics in health care, student health care services at each educational institution are very similar in scope and quality. All Orlando Campus students are required to hold an health care insurance plan. All UF COP Students, including those at the Orlando Campus, have the ability to access healthcare resources outside of their required health insurance provider, through the University of Central Florida’s (UCF) Student Healthcare Center. Students who wish to access the services at UCF’s Student Healthcare Center are required to pay the UCF’s current student health access fee at 3 credit hours each semester they wish to access services. This was approximately $130.00 per semester for the 2017-18 academic year and here is a listing of UCF’s current fees. Students may use UCF’s Student Health Services facilities, including the dental clinic, for provider appointments, nurse appointments, laboratory and x-ray procedures, physical therapy, and pharmacy services. The fee entitles the student to unlimited physician visits during the semester. Psychiatry visits are subject to an additional co-pay of $25 per visit. Dental charges apply for all services. All other additional fees for x-rays, prescriptions, laboratory procedures, injections, and orthopedic supplies are payable by the student at the same rates offered to UCF students. UCF is a participating provider for some insurance plans (Florida Blue, AvMed, Aetna, Cigna, and United Healthcare) and will assist UF pharmacy students with submission of insurance claims when appropriate. Current hours, services, and additional information can be found at UCF’s Student Health Care website. The UCF Student Healthcare Center can be contacted at 407-823-2701 for more information or to setup an appointment. If you need assistance accessing your current health insurance benefits or locating a local mental/health care professional, please get in touch with your campus’ Student Affairs Coordinator. A student can call to make an appointment and they will be seen the same day unless the call is receive very late in the day. Then, the student will be seen the next day. Clinic hours of operation are Monday through Thursday 8 a.m.-5 p.m. and Friday 8 a.m.-3:30 p.m. Health insurance will be billed for the visit including any ancillary services such as X-rays or a specialty consult. There will be no out of pocket expenses. 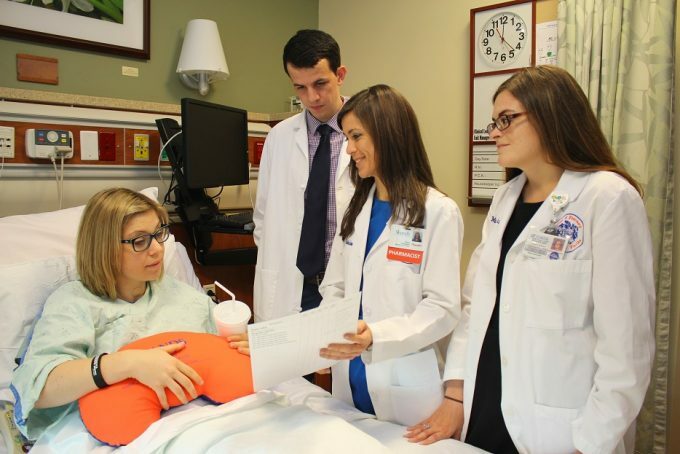 The Residency Assistance Counseling Program (RAP) through the UF College of Medicine and UF Health Jacksonville will provide confidential, free counseling for personal problems that might affect students. Stress, conflicts, alcohol or drug problems, family worries, financial/legal issues, and balancing studies/work/home life are some examples. Unlimited short terms counseling sessions for any type of personal problem are available. A decision will be made if the problem can be resolved within the scope of the Residency Assistance Program or if a referral is necessary. If a referral is required, every effort will be made to utilize a community resource that is either free, based on a sliding scale, or is covered by the student’s insurance. A 24-hour care line is available with a dedicated Resident Assistance phone number for easy access. All counselors are licensed, seasoned professional with a wide array of expertise. Phone number is 904-296-9436 or 1-800-327-9757. Qualified health care providers in the community are also available to pharmacy students at the Jacksonville campus. Utilization of community based health care providers will require payment using the student’s health insurance plan. Contact the coordinator of student affairs at the Jacksonville campus to enroll in the healthcare services available at UF Health Jacksonville. Pharmacy students in Gainesville may obtain primary care services at the Student Health Care Center that consist of general medical care (treatment of illness/injury, flu shots, other immunizations, sexual health); full-service Pharmacy; X-ray/EKG: and Laboratory. Specialty care services include allergy injection therapy; massage therapy; mole screenings; nutrition services; physical therapy; sports medicine; traveling counseling/vaccinations; and women’s clinic. For chronic care of illnesses, a referral to a qualified community provider is arranged. Hours of operation at the main campus are 8 a.m.- 5 p.m. Monday through Friday and Sunday from 12-4 p.m.. The Student Health Center at Shands is open from 8 a.m. to 5 p.m. Phone consultation services are available from the Student Health Care Center for students experiencing an urgent, non-emergency medical concern after-hours. The on-call medical provider can help you determine if you should seek medical treatment from a community facility right away, or if you can wait until regular business hours to be seen at the Student Health Care Center. Call 352-392-1161 to use this service. The Counseling and Wellness Center provides individual counseling, couples counseling, biofeedback, crisis and emergency assistance, drug and alcohol support and education, testing (attention deficit-hyperactivity disorder, personality testing for anxiety disorders and learning disabilities), and psychiatry services. The Counseling and Wellness Center can be reached by phone at 352-395-1575 for regular appointments and urgent mental health concerns.